Park Forest Estates in Breckenridge CO Real Estate are a mix of single family homes and duplexes. Located off Ski Hill Road, Park Forest Estates is a few bus stops from the base of the Breckenridge Ski Resort. The properties were built between 1994-1995. There are 45 homes in Park Forest Estates with 3 bedrooms each, around 1900 square feet and set upon approximately 0.05 acres. Each Breckenridge home in Park Forest Estates comes with an attached one or two car garage. 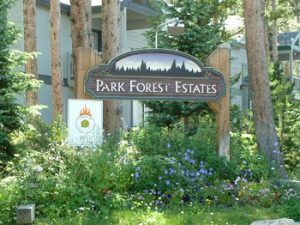 Set among the trees, Park Forest Estates is a great subdivision to purchase a more affordable home in a great location in Breckenridge Real Estate. Park Forest Estates does have quarterly dues which include snow removal, water/sewer, trash pick up and cable television. When searching for an in-town home for sale in Breckenridge CO, Park Forest Estates is an area to consider. To arrange a time to view a property for sale in Park Forest Estates or other properties in Breckenridge Colorado Real Estate, contact Justin and Krystal Knott with LIV Sotheby’s International Realty.